Since opening in 1963, Cuyahoga Community College has awarded more than 98,000 degrees and certificates to alumni. We are proud of our graduates and the contributions they make to Tri-C and our community, across hundreds of professions. The Office of Alumni Relations is pleased to introduce our 2019 Distinguished Alumni Awards to recognize alumni for their service and volunteer work with the college, their professional accomplishments and our local community. Honorees will be announced at the 2019 Advisory Board Breakfast in June. The Distinguished Alumni Award is presented to an alumnus or alumna who has established himself or herself as an accomplished professional, demonstrating notable achievements and/or College and community service, having earned a Tri-C degree more than 10 years ago. 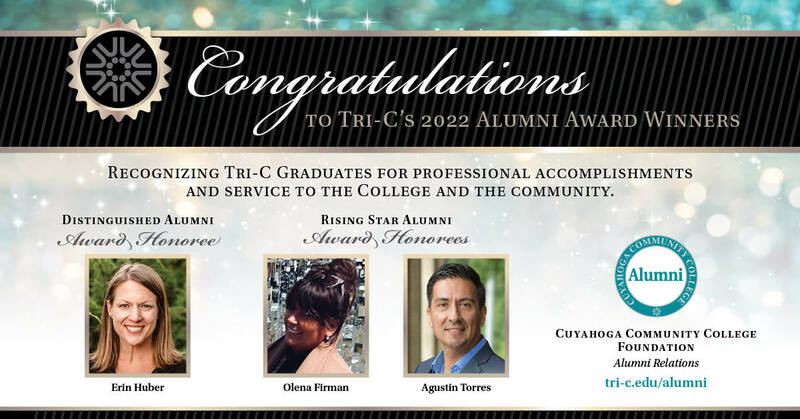 Rising Star Alumni Award is presented to an alumnus or alumna who received his or her Tri-C degree within the last 10 years whose work and commitment is making a difference for our College or community.